Some of the most exciting and important uses of 3D printing technologies are predictably coming from the medical community. While the medical use of this technology is still in its relative infancy, the possibilities are nearly endless with regards to health care applications. Some examples of medical 3D printing currently in use and/or under development include 3D printed skin used for treating burn victims, implants for bone and joint replacement, and facial prostheses. A major benefit of medical 3D printing is the potential for reducing the costs involved for facilities and patients. Due to the precise and additive nature of the technology, the costs associated with removal and waste of excess material is reduced, as well as waste produced by manufacturing defects. As the development of newer technologies like 3D bioprinting progress, we can expect to see breakthroughs involving the production of major organ replacement tissues such as liver, kidney, heart and lung tissues. One example, commercially available 3D printed liver tissue has been in production since 2014 and has been marketed primarily for preclinical drug discovery testing. Even more recently, researchers announced the successful development of a 3D printed tissue that mirrors the structure and function of a human liver even more closely than the products that are commercially available, using a bioprinting technology referred to as Dynamic Optical Projection Stereolithography. 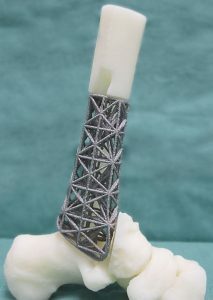 Duke Health and the Duke University School of Medicine are actively embracing this technology, and are extensively using 3D printing for such tasks as recreating metal foot and ankle bones in their Orthopedic Care facility. Duke Surgery is utilizing the technology to produce aortic and facial skeleton prints to assist in surgery, and the Department of Pediatrics has printed replicas of hearts from MRI and CT scans of patients to assist in teaching its students about congenital defects.